Dearly beloved, we are gathered here today to get through this thing called life. Those are the first words I thought of when I saw the cover for “Batgirl” this week. As a big fan of Prince and Purple Rain, this was a must have the second I saw it. I bet some of you are saying, why are you doing a review based on the cover? Well...because I can that's why! Just kidding everyone, there is no need to click that little X in the corner. Just stay right here and keep reading. Batgirl 40 begins with Batgirl facing off against a computerized darker version of herself. 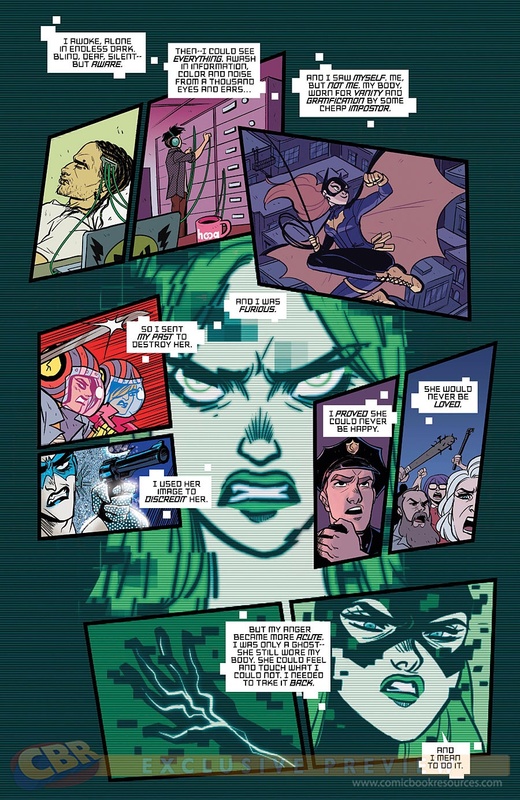 Said darker version of Batgirl is a result of a computer program that she was working on while recuperating from her injury, inflicted upon her by The Joker. This digital version of Barbara has been corrupted by her own anger at what has happened to her. Riot Black makes an appearance as an enforcer for the corrupted version of Batgirl. His inclusion in the issue is brief, and fits in nicely. When Batgirl discovers the her corrupted version plans to kill residents of Gotham who may have become criminals or have criminal connections later in life, Batgirl is able to free herself. This issue is action packed and reads incredibly quickly. The issue passes quickly because it really never stops, which I happen to love. Constant action, no areas of distraction and or boredom from a lull in action.. This issue is done in such a way that you never get tired of what's going on. The dialogue is fun and written in a way that expresses the writer's deep comprehension of the characters for whom they write. Personally, I think this is really refreshing because there are instances in which writers don't seem to understand or have a grasp on their characters. The art is great in this issue. The corrupted Barbara is drawn to portray a static image, which fits very nicely for a character who is on the edge and unstable, as readers learn when the story unfolds. The emotion is portrayed through subtle changes in the color in the flashback panels. I walked in not expecting a whole lot from this issue as I picked up on a whim solely based on the cover's reminiscence of Purple Rain. However, it was an enjoyable read and the art really looked phenomenal. If you're a Prince fan like me and want to pick this up for the novelty, go for it. Take a read through the pages once you get home, and I have a feeling you'll enjoy it. And even if you aren't a fan of Prince, I suggest you go ahead and pick it up. It really is a fun read that is executed incredibly well.